The University of Peace in Africa is learn and change project that offers impowerment and contributes to promotion and constant rebuilding of Peace. 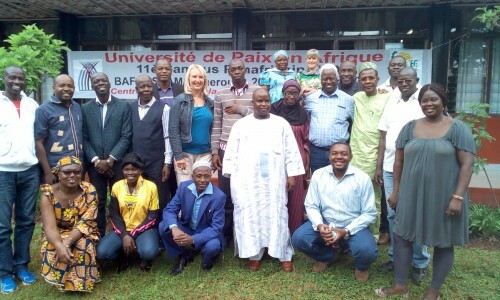 UPA is designed and initiated by three civil society organisations widnessing a dynamic North-South and south-South partnership: AMI (Rwanda), APTE (Germany) and CIPCRE (Cameroon). UPA is organised as a full boarding Campus (concept ‘summer university’) in a rotative way each year in a different african country following invitation from local Peace initaitves. UPA aims, year by year, to create and reinforce (new) capacities and courageous attitudes of Peace Builders as genuine catalysts in their respective communities and societies. as managing and supporting (international) co-operation for peace. a panafrican, intercultural setting that allows you to reach beyond short weekend sessions, theoretical seminars or local workshops. The network of 250 Laureates of 15 years' UPA: Peace Builders from 30 countries, in various responsibilities and strategic positions. They join their efforts in GEP-Groups (Group of Transformation to Peace) in their country: "It is not how far we have came, but how far we can go"